School assemblies- screaming "89,89,eighty,eighty,eighty,89!" For the spirit stick. Shaggin' the Drag looking for boys and someone to buy beer (not necessarily in that order). Kimberly Koester Urdiales updated her profile. View. Kimberly Koester Urdiales has a birthday today. 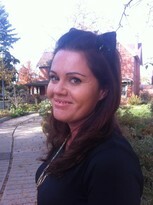 Kimberly Koester Urdiales changed her "Now" picture. Kimberly Koester Urdiales changed her profile picture.